About Roma and Plum Tomatoes and Other Types. Scientifically, tomato is known as the Solanum lucopersicu and it is from the family of Solanaceae. The tomato is a popular fruit and vegetable. It can be consumed raw or cooked or as other processed product. The tomato is popular not only because it is versatile, in term of the cooking preferences, but it is delicious as well as beneficial for health. The positive health reinforcement is caused by the lycopene and the other vitamins in the tomato. 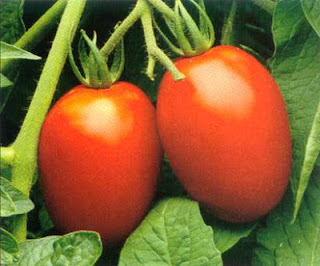 The tomato has so many types and among the big size tomatoes, there are the Roma and Plum tomatoes. Many people find it difficult to differentiate the two just like many people have the same difficulty in telling the grape and cherry tomatoes apart. The Roma tomato is known to be one of the most popular tomatos. They are not the most expensive variety and can be easily found in the supermarkets. They are the Italian tomatoes and also known as the Italian plum tomatoes. They are available in different colors, namely the yellow and red color. Their shape is not perfectly round, instead they are pear shaped tomatoes. The countries that are the major produces of tomatoes are the Australia, Mexico and United states. Just like any other tomatoes, the Roma Tomato is also processed into sauce and canned tomatoes as some of their preservation process to prolong their lives. After all, they can only be enjoyed for less than a week at their best and ripest times, and after that, they will start the rotting process. They are considered to be one of the best to be processed into processed food because they have less number of seeds as well as smaller seeds, especially compared to their big sizes. On the other hand, the plum tomatoes are also one of the most popular variety of tomato, especially in the United States and Europe. This plum tomato can also refer to the processing tomatoes as they have specific purposes in the usage. The plum tomatoes have oval shape and sometimes also cylindrical. As the shape is similar to the Roma tomatoes, many people could not differentiate at first glance. The plum tomatoes, in the inside, have less seed compartments and also less water. These are the two things that serve as benefits when turning this type of tomato into paste or sauce. They benefit the final product because due to those facts, the plum tomatoes give more end results.